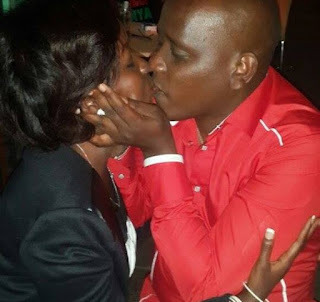 Director of Digital Media and a Diaspora at State House Dennis Itumbi had earlier rubbished rumors that he was dating Citizen TV's reporter Jacque Maribe as he claimed she was only a close friend. Now evidence has hit the entire blogosphere in the country after a photo off the two locking lips surfaced online. The two have been making headlines for the better part of the week now and after Dennis surprised his girlfirend with a sumptuous cake here is a heart warming message he penned down for her.